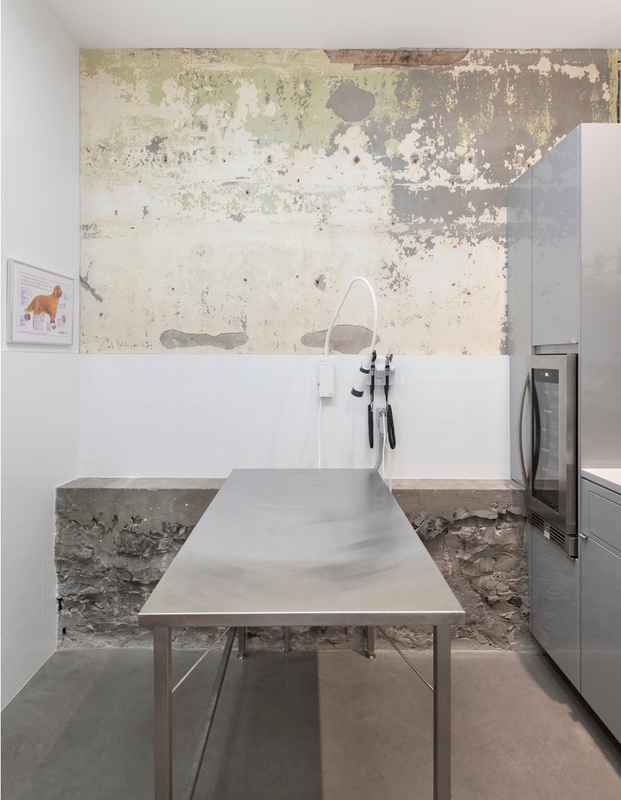 When people and their pets enter Hôpital Vétérinaire du Parc, a veterinarian hospital and SPCA emergency clinic in a former photography studio in Montreal’s Mile End neighbourhood, they are met with uplifting design. The glass vestibule entrance leads into a chic space with concrete flooring and walls protected from scratching paws by stone foundations, concrete wainscoting and ceramic tiling. A peekaboo, glassed-in cutout looks down into the grooming area below. 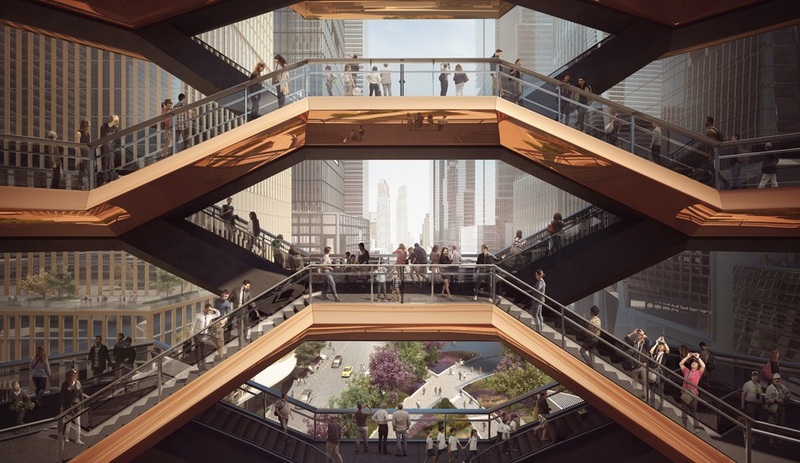 “We wanted to ease some of the anxiety that comes with visiting a hospital by providing a few distracting, playful moments,” explains Jennifer Thorogood of T B A, the firm behind the project. The ceiling panels, in milky polycarbonate, hide a complex mechanical system and reveal modest graphic lighting. “We wanted the main source of lighting in the common spaces of the hospital to be minimal and soft,” says Thorogood. “We also wanted it to act as a unifying graphic element so we chose to place a diagonal grid of standard strip lights behind the polycarbonate panels – pretty much a fancy, custom suspended ceiling system. The effect is a consistent foggy glow that is bright enough to light the large open spaces.” Fine-tuning the lighting in this way was also made as a special consideration for four-legged clients. In other ways as well, the design team not only made the hospital resistant to animal wear and tear, they also designed it for maximum comfort for both pets and their human family members – for example, providing shallow stairs and landings for older animals with mobility problems and making soundproofing a priority. 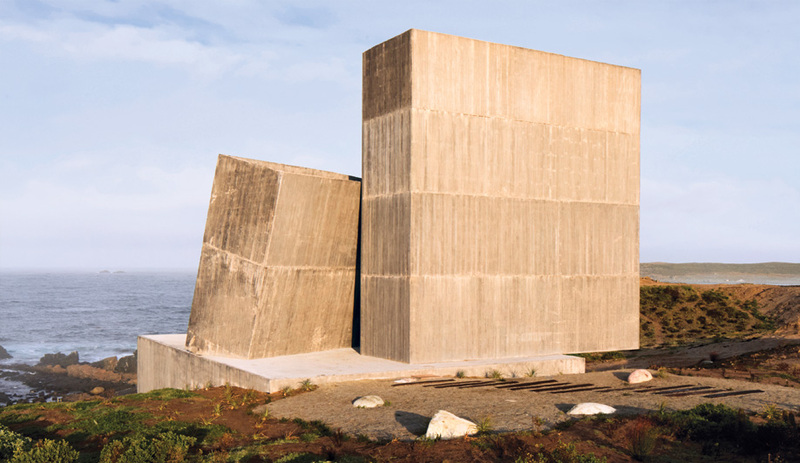 “Other elements become more about the connection between animal and human – playing with quantities of glazing to maintain or block views in the different kennels and treatment rooms. 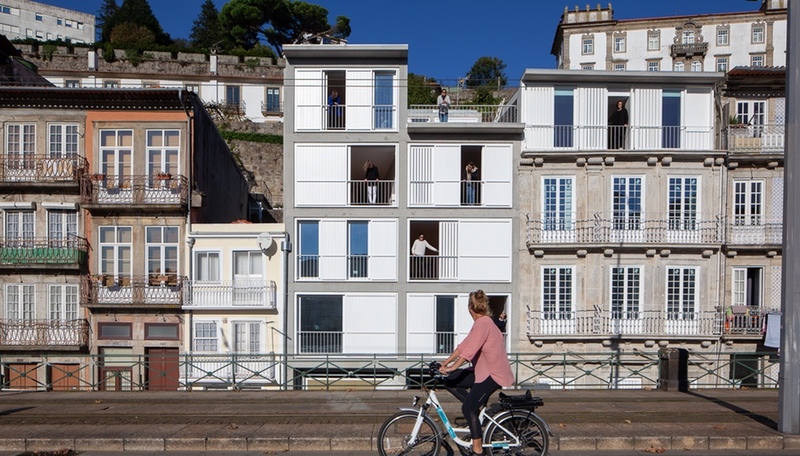 Some elements were more for the owners: for instance, the kennels are clad in a warm, light blue tile, even though dogs perceive colour in a limited way, it is calming for their stressed owners,” says Thorogood. 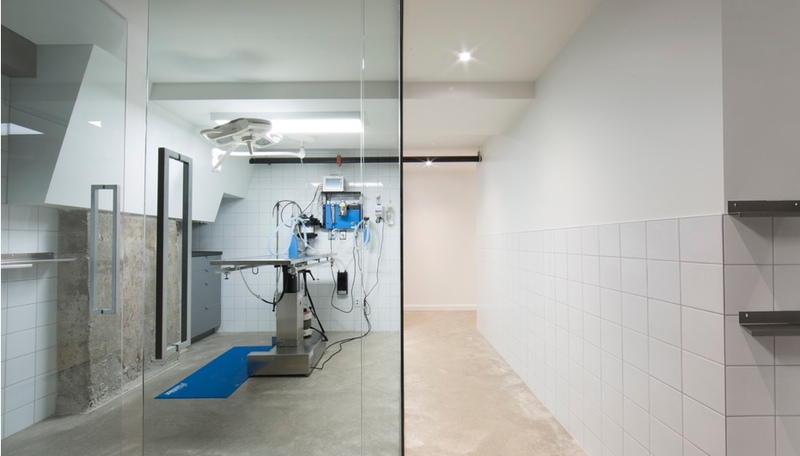 This is the fourth veterinary clinic, and second for MTLVET, that T B A has completed. 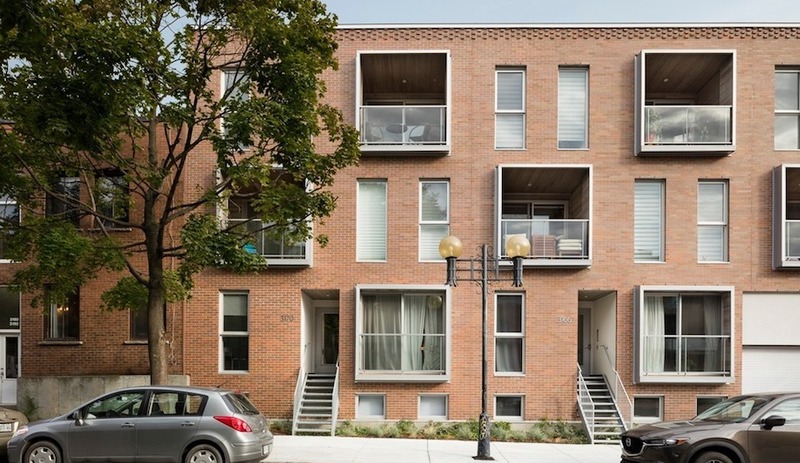 But it’s the first to encompass the design of a complete mixed-use building that includes the owner’s apartment. And that is where this project truly shines. 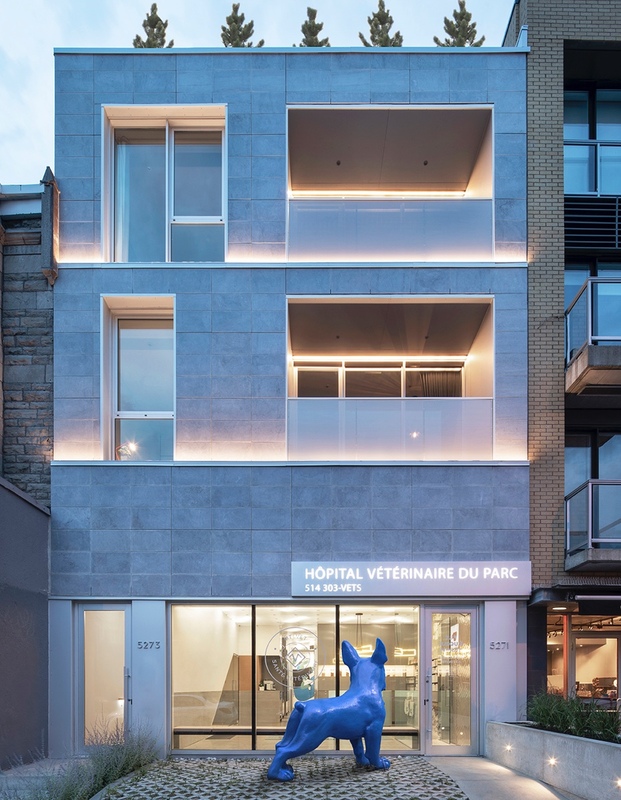 The veterinary clinic is a great interior in and of itself, but topping it with a two-level residential – for a total of 345-square-metres of space – and making both feel unique and special in their own way is an accomplishment. 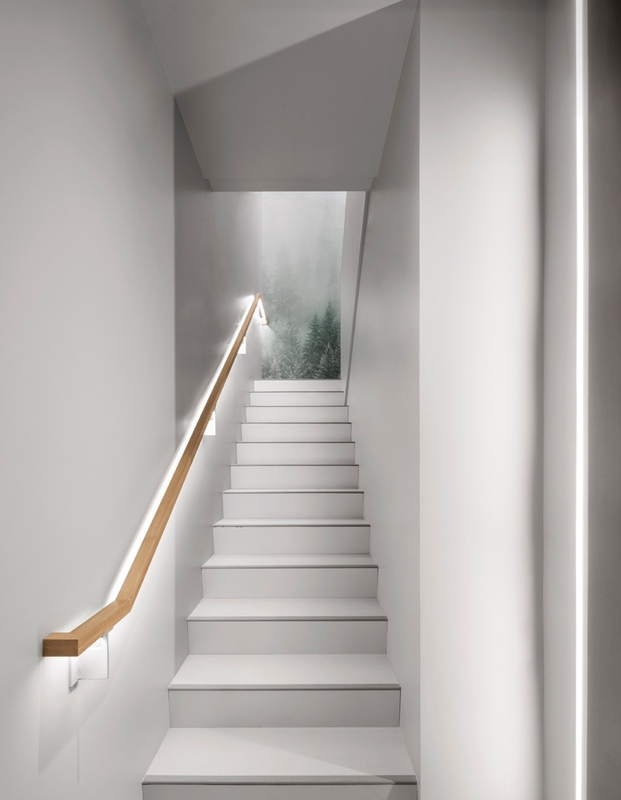 The owner’s home features wood cabinetry and casegoods and white walls – a minimal palette enhanced by T B A’s deft use of lighting as a material. 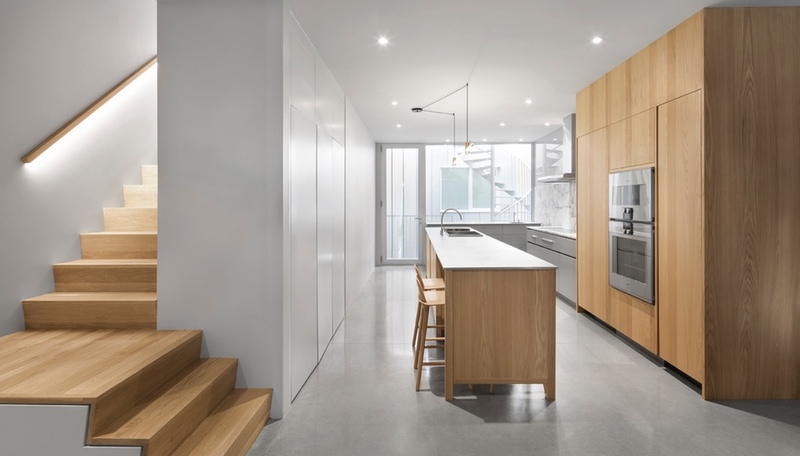 It takes a daring client to invest in design from start to finish, from workspace to living quarters – and this particular client was just as interested in ensuring his live-work space fit into the neighbourhood.